With Natalie Bennett, leader of the Green Party, making an appearance on Streatham Campus, Exeter's Exeposé Features Editors James Roberts and Imogen Watson talked to her about fracking, Australia and being a woman in politics. It’s a quiet Saturday afternoon and the Green Party are taking over campus. Natalie Bennett has shale gas on her mind, and is preparing to introduce a video starting Exeter’s fightback against fracking. 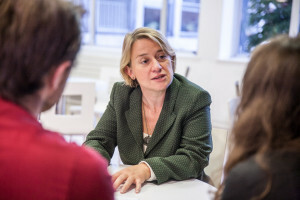 “We’re on the path to catastrophic climate change,” Bennett explains with an urgency rarely seen outside the Green Party, “we have to leave at least half of our fossil fuels in the ground.” No doubt, Natalie Bennett is on a mission. The first thing that strikes you when meeting the leader of Britain’s fifth largest party is her Australian accent. “My accent is classless,” Bennett explains, “it’s quite useful really.” She was born in Sydney, and worked for many years on provincial Australian newspapers before her big break in Bangkok. Was it in the Australian bush that she was first bitten by the political bug, we ask? “Australian country politics is mainly conservatives, and people who think conservatives are soft and wussy and not good enough on the death penalty. There wasn’t much politics to be involved with,” Bennett answers with a chuckle. She is surprisingly adamant about her own real world credentials for a civil servant-turned-journalist-turned-politician, perhaps aware of the particular public wrath reserved for the cloistered and the careerist. “I joined the Green Party on 1 January 2006,” she recounts with an intriguing mix of precision and surprise, “seven years later, here I am, leader of the Green Party!” Despite her genuine warmth, Bennett is clearly a cool political operator in British Green politics. Presumably then, we can expect to see much more of Natalie Bennett on our television screens; much like Caroline Lucas herself, who was recently arrested at a protest against fracking in Balcombe. Bennett is startlingly forthright about the prospect of her party’s foremost eco-champion appearing in court. “The Green Party has always believed that sometimes non-violent direction action is an essential step because people just don’t hear otherwise,” Bennett states with rehearsed certainty. With an impish smile and knowing glance, she adds, “we were getting a lot more attention after she was arrested.” Clearly, then, despite her ambition to become a London MP, an attachment to the established political process has yet to manifest itself. At the same time, Natalie Bennett seems both encouraged and off-put by the recent success of their friends on the fringe, UKIP. “You can understand a number of reasons why UKIP is attractive,” she says, though quickly pointing out the considerable ideological differences between them, “a lot of [their supporters] just look back to some golden age of the 1950s that they think existed, and would like to go there.” Are there similarities between these two very different maverick movements? “A lot of UKIP voters are disillusioned Tories who think that the Tories are horribly incompetent in government,” Bennett explains, adding, “Which is true.” Beyond this, and the somewhat mischievous tendencies of their party leaders, one cannot help but feel that Bennett sees little else in common. On the attack, she deplores that “UKIP has what sounds like a superficially simple message that looks attractive to some people: if we just got out of the EU and stop immigration, everything would be wonderful, sweetness and light.” Her contempt for their policies seems as clear as her jealousy of their performance. Green with envy, indeed. While these policies have yet to infiltrate politics proper, Bennett clearly sees universities as a good place to start: “and the one that I always mention in universities: we believe in zero tuition fees.” Apparently, with a new Green Society on campus, Exeter maybe poised for its own Green revolution. So what’s ahead for the Green Party in the 2015 election? “Brighton Pavilion did it, and any seat in the country could do it too,” Bennett prophesises. Change in the political climate or not, after 2015, the grass may be greener on the other side. This article originally appeared on Exeposé.